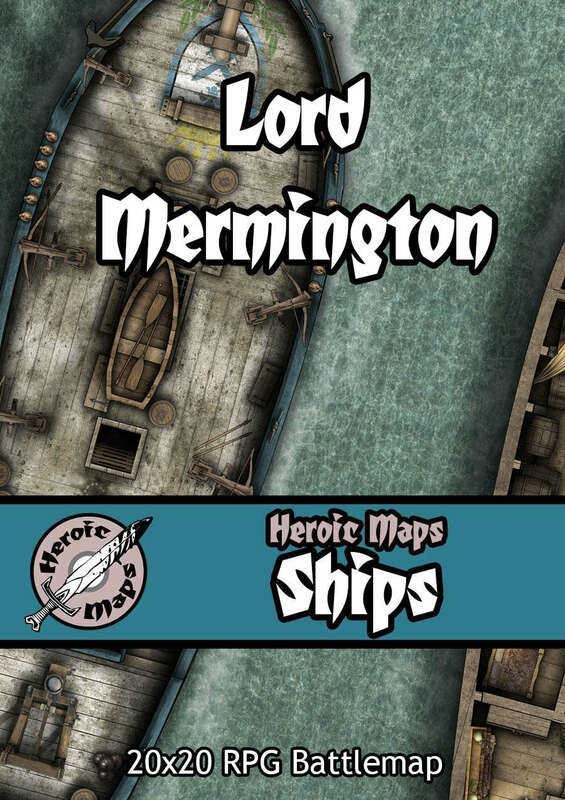 Named after a famous (although rather corrupt) noble, the sloop Lord Mermington patrols the waters near the Royal Docks, providing an armed deterrent against raiders. A printable rpg battlemap compatible with any RPG/Dungeon-Crawl or skirmish game. Use as a standalone gameboard, or combine with any same-scale tileset. Each deck occupies approximately 15x6 squares. Contents: A sloop-style sailing ship. The top deck features a wheel, hatches, six ballistae, a catapult a windlass and other nautical details,The lower deck includes the captain's quarters, stores, crew areas and hammocks. 300dpi A4 pdf spread across multiple pages for easy printing. Oh no! We're being boarded! This title was added to our catalog on April 14, 2019.